An anniversary knife is a special treat for collectors, if they’re done well. Spyderco did it right by carefully selecting the right design and adding some unusual features you won’t find in an ordinary production knife. 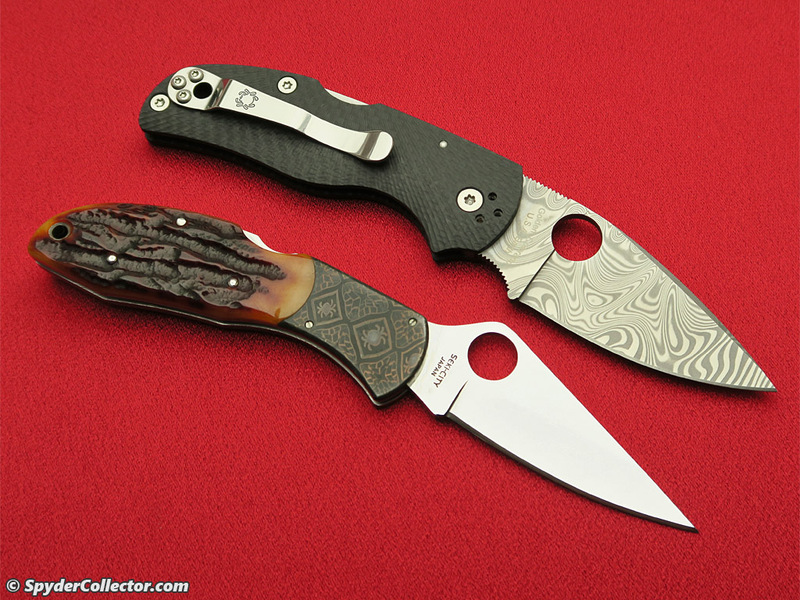 The 25th Anniversary Delica and 40th Anniversary Native 5 are, in my opinion, more than just ‘cool commemorative knives’. I’d like to think both knives are also interesting expressions of this wonderful knife company at two different points in its impressive, but still recent, history. 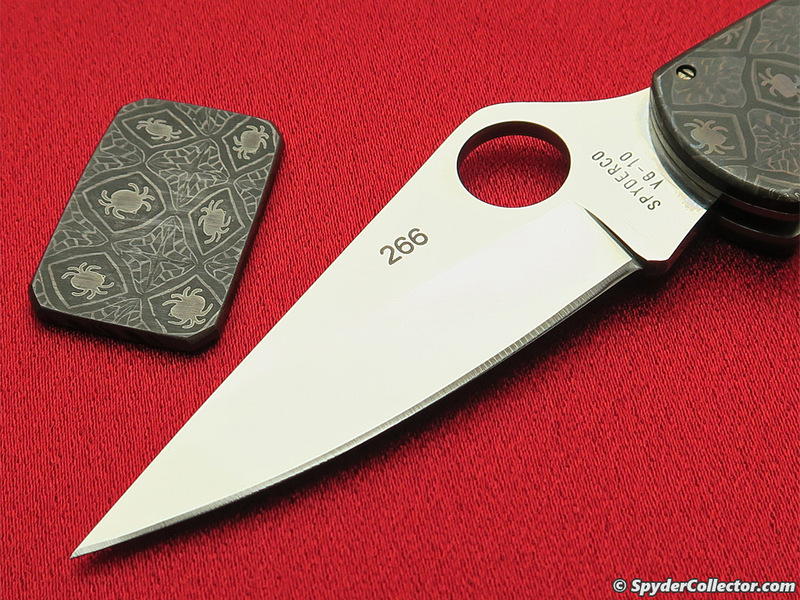 Spyderco celebrated its 25th anniversary in 2003. This occasion was celebrated by the release of the C76 Anniversary Delica. Wait wut?! A Delica designated C76 instead of C11? I don’t know why the number was changed, just accept it. 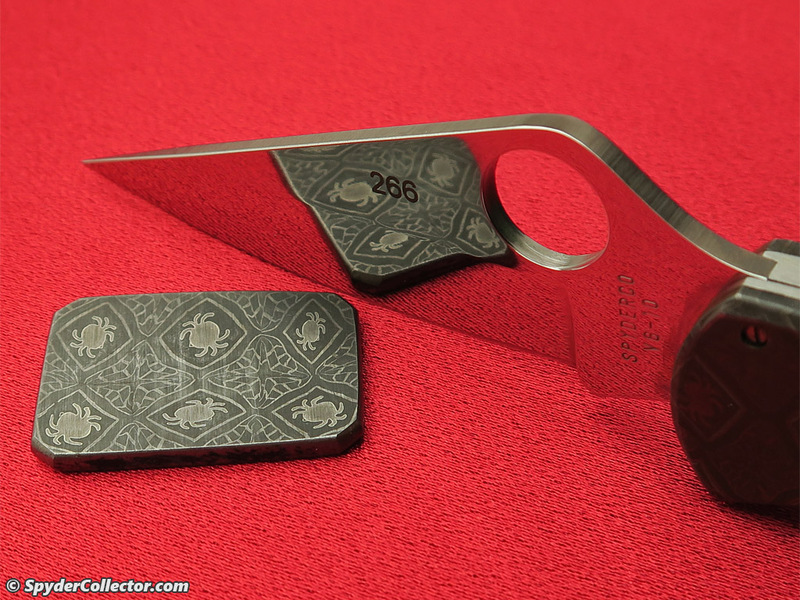 The C76 was only made for one run of 500 pieces by Moki, one of the very best Japanese knifemakers. All the knives were individually numbered. The Delica makes sense for this celebration. 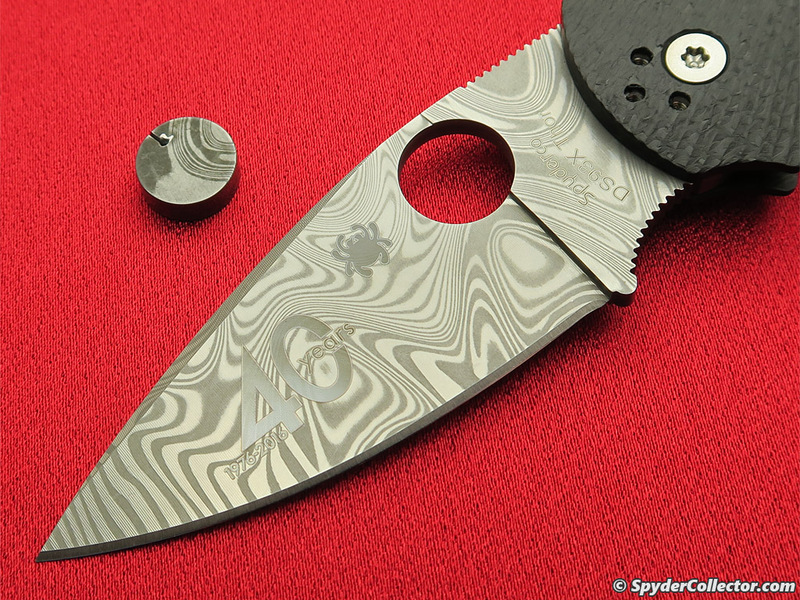 It’s been a watershed design for Spyderco that helped bring their unique design to so many happy knife users. Even back in 2003, there had already been three generations of the design as well as many different production variations. 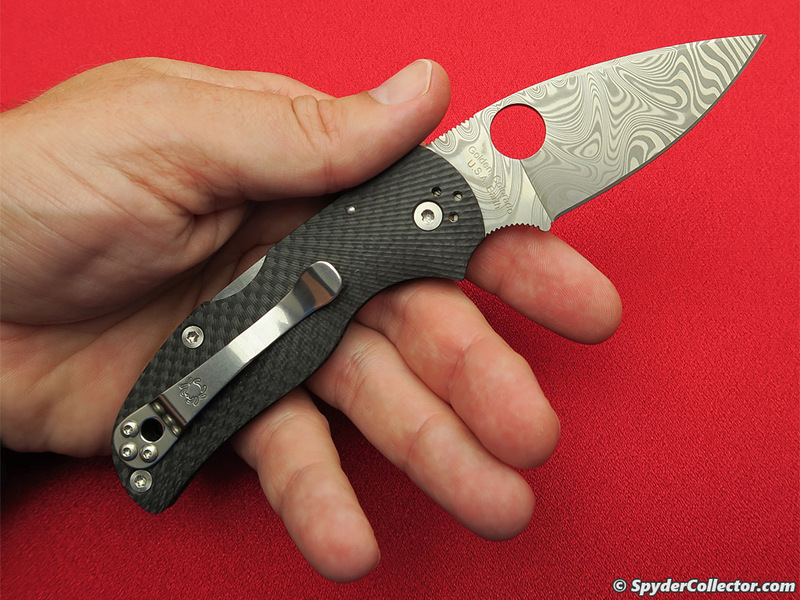 At the time, the knife’s MSRP of $529, 95 was the highest price Spyderco ever had to ask for a knife. It caused some online complaints, but that died down quickly. Try to find one now, good luck! That pretty much says it all. I never got one back in 2003, it was too rich for my blood at the time as I needed to finish my studies first. After entering the workforce for a few years, I managed to come across one at an offer that was too good to pass. It’s been somewhat of a grail knife for me. If I recall correctly, the C41CF40TH 40th Anniversary Native 5 was formally announced at the 2016 Amsterdam Meet. The knife was released in September of the same year in a run of 1,200 knives. 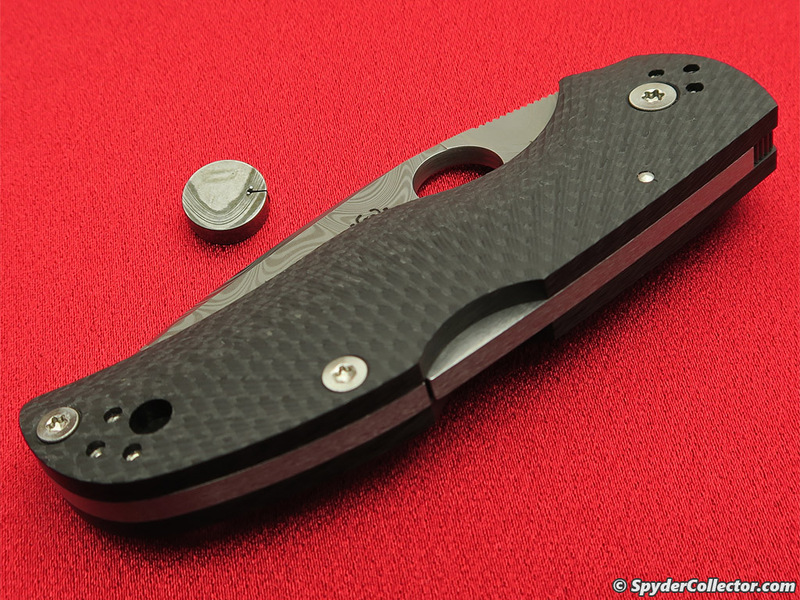 The Native 5 has, at least in my opinion, become the new flagship knife for Spyderco. It might not be as ‘exciting’ a design as say a Nirvana. The Native 5, however, does features an excellent design with superb construction and impressive fit & finish. Furthermore, in its FRN incarnation, this new Native still qualifies as a working knife for many people. Just look at Eric when he talks about the Native 5 at a show or meet. 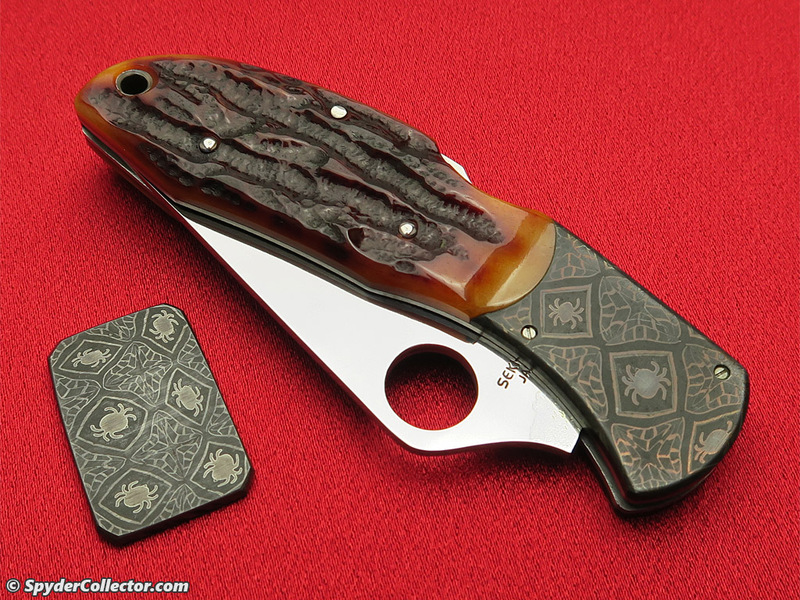 He is rightfully very proud of the quality and usability Spyderco is able to offer with the Native 5. Wait huh? A 25th anniversary in 2003 and a 40th anniversary in 2016? Who’s doing the math here at Spyderco HQ?! Easy there, it’s like this. 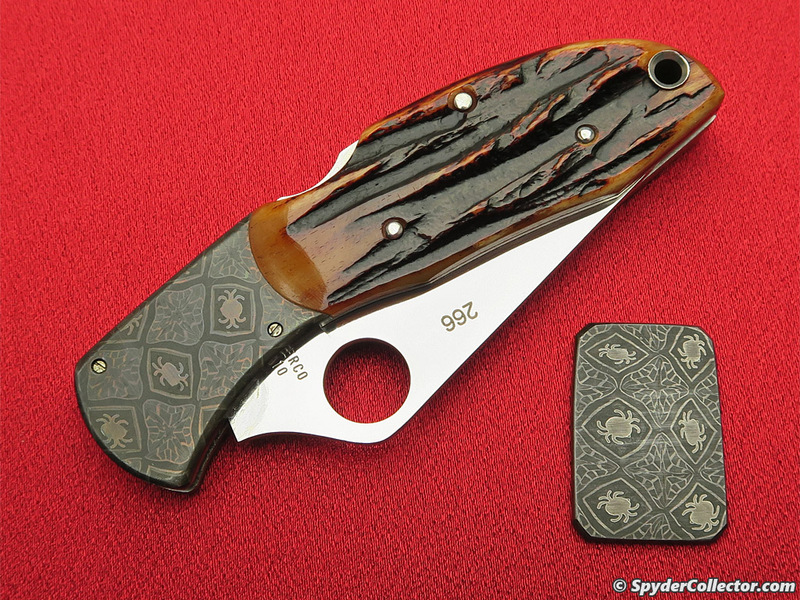 In 1981, Spyderco made their first knife, the C01 Worker. But the company start back in 1976 when it made the portable hand, a device used e.g. for making precision electronics. 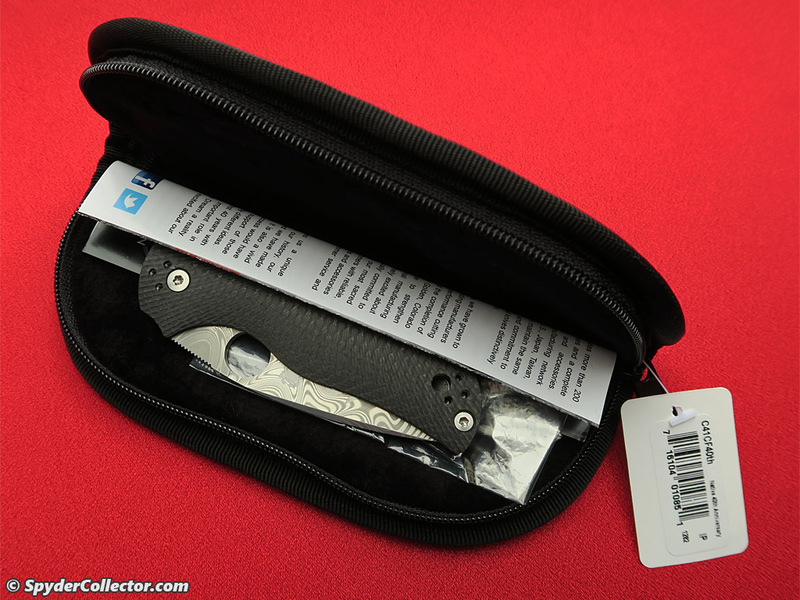 Later on, Spyderco made sharpening products and that led to the development of the first one-hand opening clip carry folding knife we all love so much. I ordered a 40thAnniversary Native 5 as soon as possible and have been pretty happy with the knife in my collection. It’s definitely a different kind of knife than the C76, but more on that later. 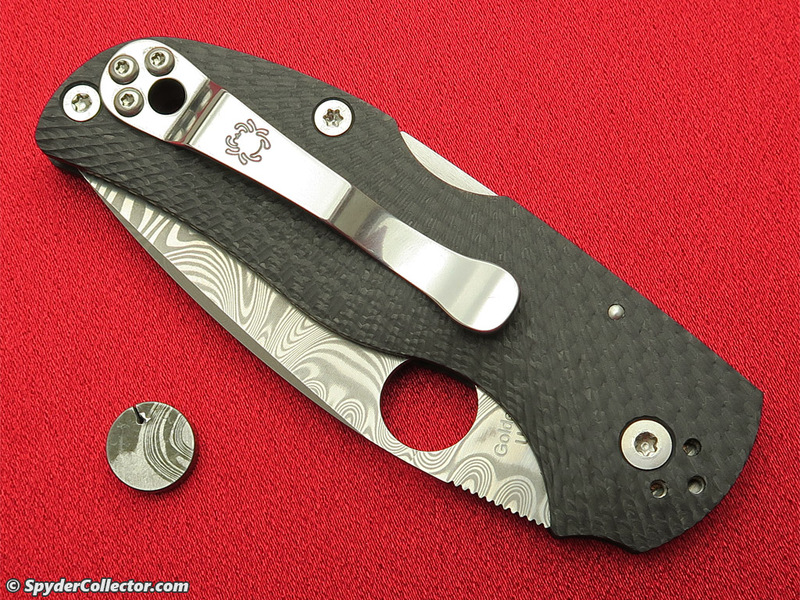 The 25th anniversary Delica features a hollow ground VG-10 blade with a mirror finish. 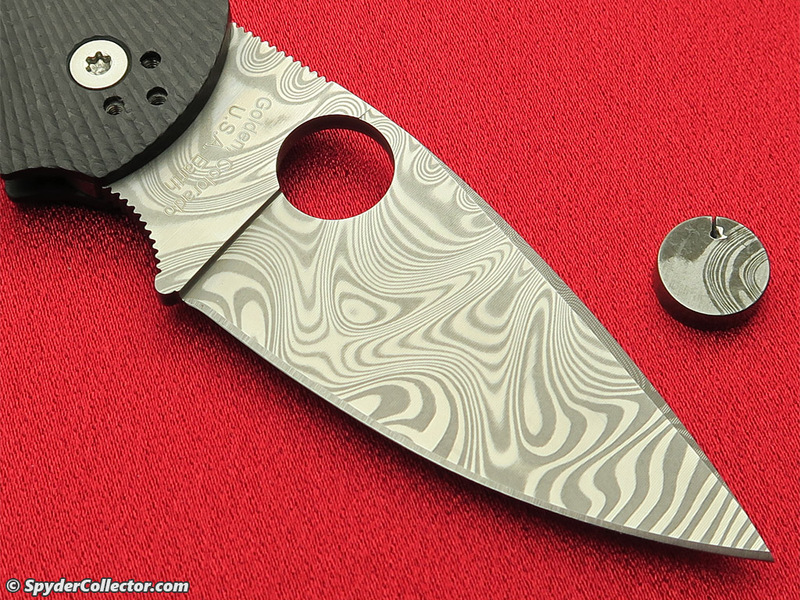 Other than the mirror finish, it’s the same blade you would find on a FRN Delica 3. 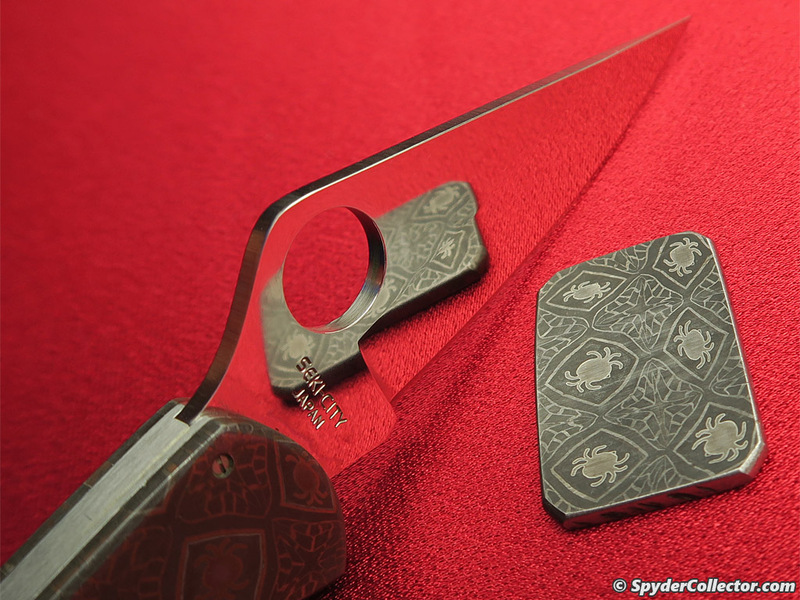 The blade is 74mm long, 2.5mm thick and the edge is around 63mm long. It’s nicely finished with very even bevels and even the edge has been sharpened very precisely. 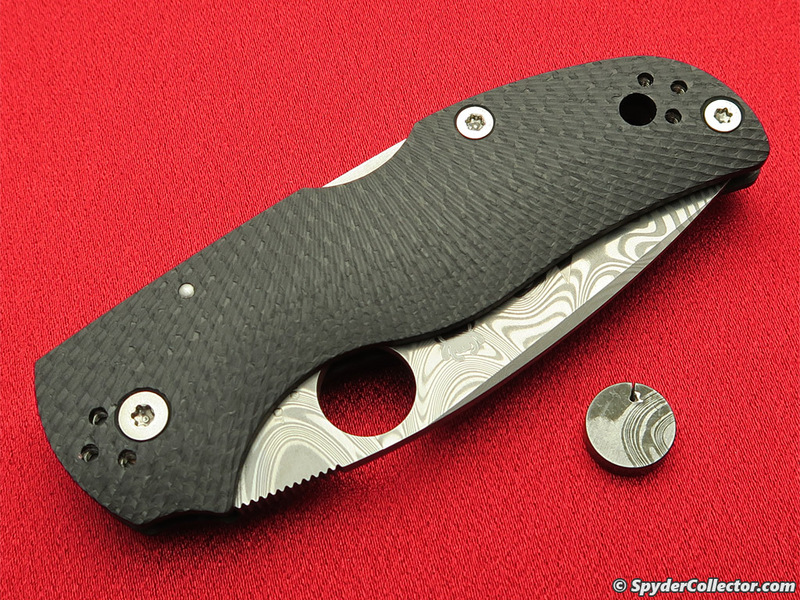 Mind you, this was before Spyderco started to use a sharpening robot on selected models. I’ve only used this blade to open a few gifts at Christmas. And that’s probably all the workout it will ever get. This is a very rare piece that I’m very careful with. I feel, the 40th anniversary Native 5’s blade got a nicer treatment than the C76. This time the production steel (CPM S35N) was replaced by something special: Thor™ pattern Damascus steel from the Swedish firm Damasteel® (who apparently used this steel to celebrate their own 40th anniversary in 2016). The Thor Damascus was made from layers of RWL34 and PMC27 steel. The blade is flat ground and finished pretty much like a regular Native 5. 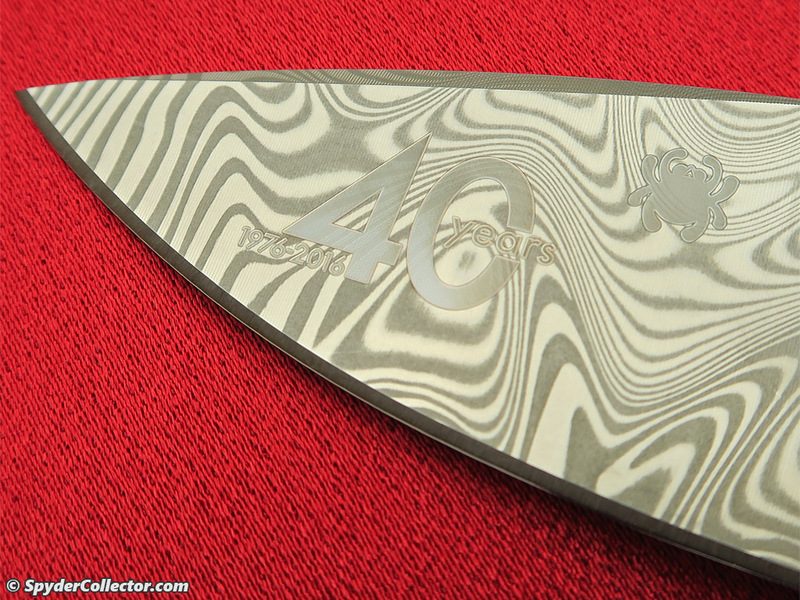 A distinctive feature on the blade, apart from the Damascus, is the laser engraving denoting this to be the 40th Anniversary knife. Some feel the engraving is too garish. I think it matches well with the Damascus swirls. More importantly, this is an anniversary knife. And, overall, this Native is kind of ‘subdued’ and without the engraving it could very well be a ‘regular’ sprint run. So I’m personally OK with this engraving. In addition, attendees of the 2016 Amsterdam Meet got a Damascus hole cutout from this very knife! The C76 handle is a real treat for collectors, as it features a Damascus bolster handmade by master smith Ed Schempp! 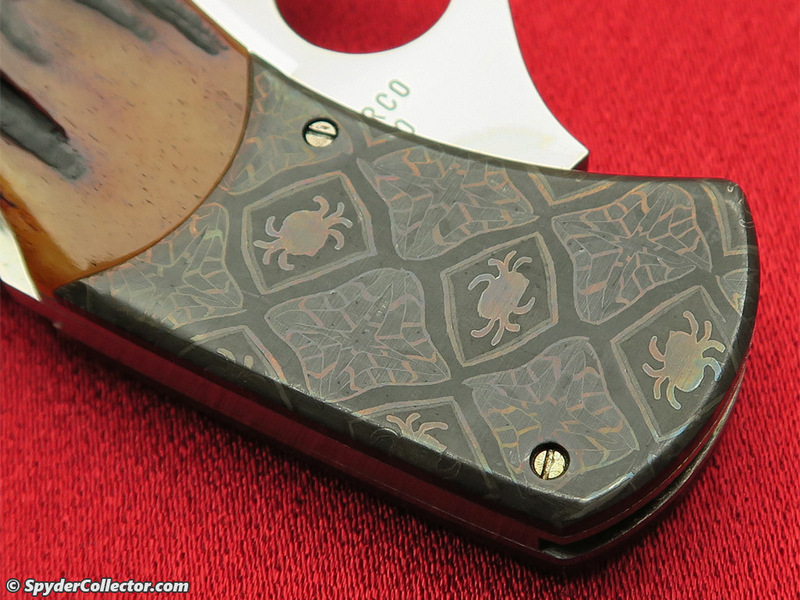 The Damascus pattern features the Spyderco bug logo in a web pattern. A very striking and welcome feature for this anniversary Delica! In Ed’s own words: …To get the 40 some pounds of bolster material for the twenty-fifth anniversary knife I forged about 450 pounds of steel in primary billets, The forge scale loss was about 15% the balance was to cutting and grinding. This project took about three months of forging and labor. I think that gives you an idea to why the material is expensive…. 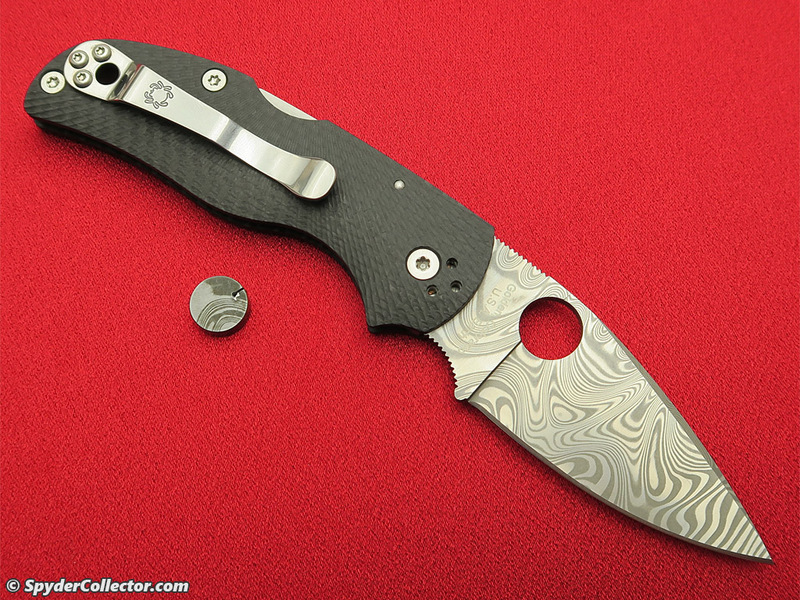 Ed did end up with some ‘spare’ bolster material which ended up in the hands of some collectors and Spyderco afi’s, as Damascus tiles. This stunning bolster is mounted in a stainless steel handle frame that’s also the base for genuine honey colored jigged-bone scales. I really like how both the bolster and handle scales are natural materials that differ from knife to knife. The clip was left off this wonderful handle. I bet the mounting would’ve been problematic for the horn material. Oddly enough, for a knife that has a striking ‘classic’ look, the more modern boye dent was added to the locking bar. 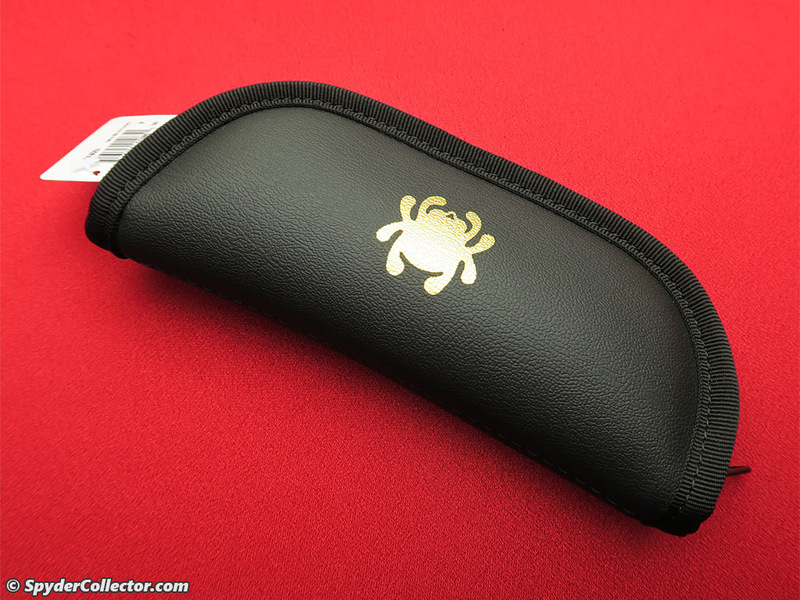 I think the ‘dent’ doesn’t fit the design cosmetically, but it was a defining Spyderco feature at the time. The 40th anniversary Native has a wonderfully striking handle made from solid carbon fiber with a machined fluting pattern. 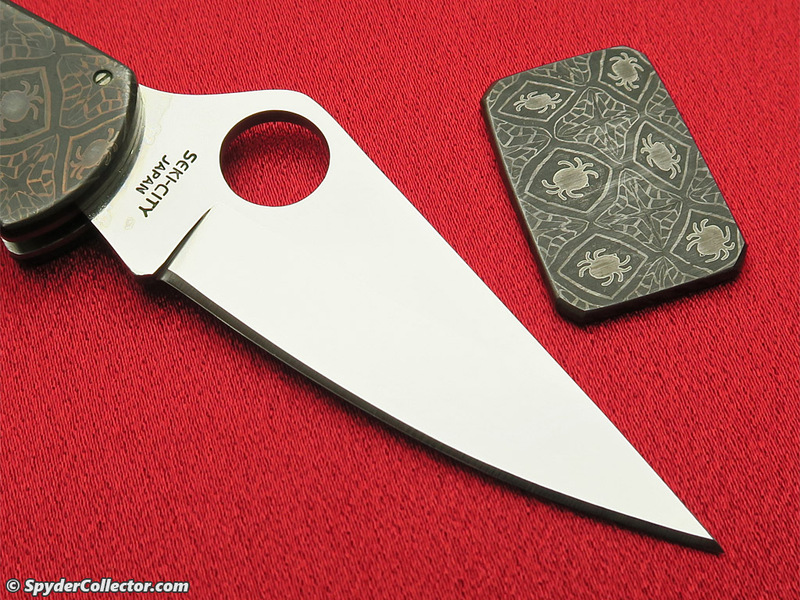 Spyderco had been working with the fluting process for a few years at the time of this knife’s release. First with the titanium handle Military, and later on a titanium handled Native 5. They never managed to produce these ‘fluted’ knives in large quantities though. I did see a prototype carbon fiber fluted ParaMilitary 2 at one of the Amsterdam Meets. And I think it’s very nice to see this type of handle released for the first time on the anniversary Native 5. As cool as the fluting is, it also makes the knife kind of subdued, which to me is a bit odd for a knife that celebrates a momentous occasion. The Native features a regular stainless steel hourglass clip. I think this knife could have used a bit more ‘wow’; one more accent that makes this more of a celebration knife. And I think the clip could have been that feature. Now, I’m certainly not a knife designer or maker. But if it were possible, I’d love to have seen a Damascus clip or another twist on the clip to make the knife stand out a bit more. I do appreciate how the 4-way clip mounting invites you to actually carry and use the knife. Something that the C76 definitely doesn’t do. 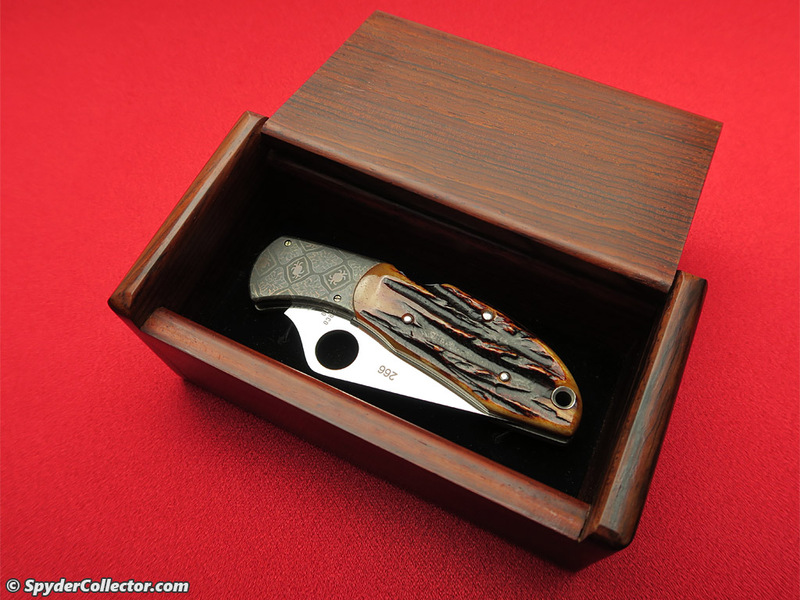 When it came to the packaging, again, the anniversary Delica got a nicer treatment with a special cocobolo rosewood box. 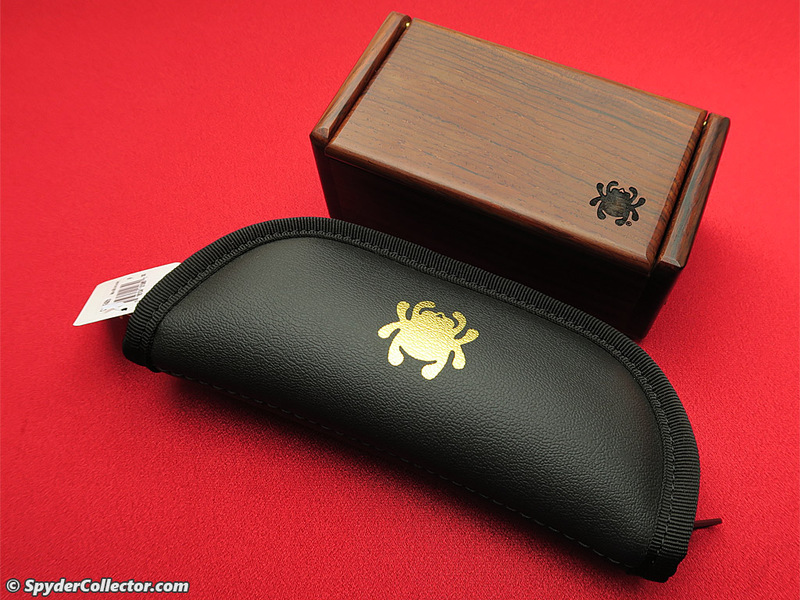 The 40th Anniversary native was shipped in a zippered pouch. Sure, the pouch is more practical to actually use to transport your knife etc.…. 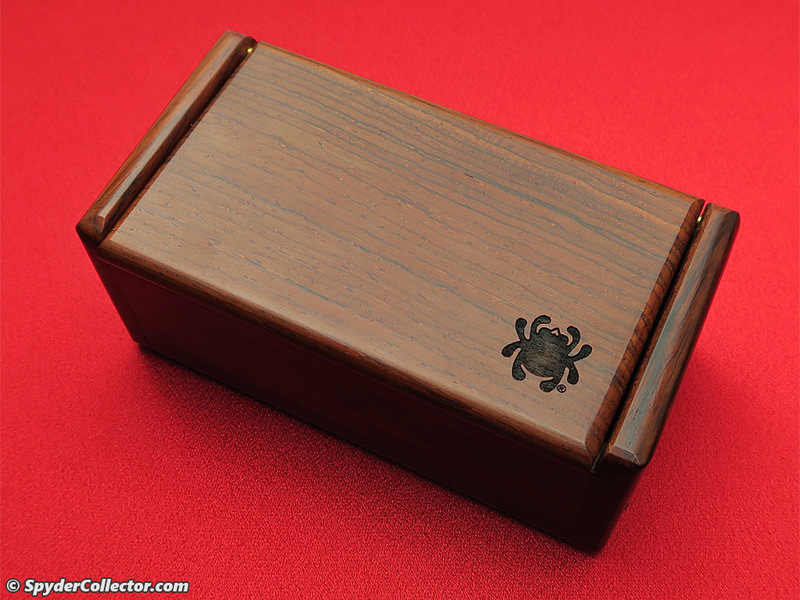 but that cocobolo box just ‘pops’ in my display case! I love both of these very special anniversary knives. Studying them a bit further I get the impression that they both reflect their main designers very well. 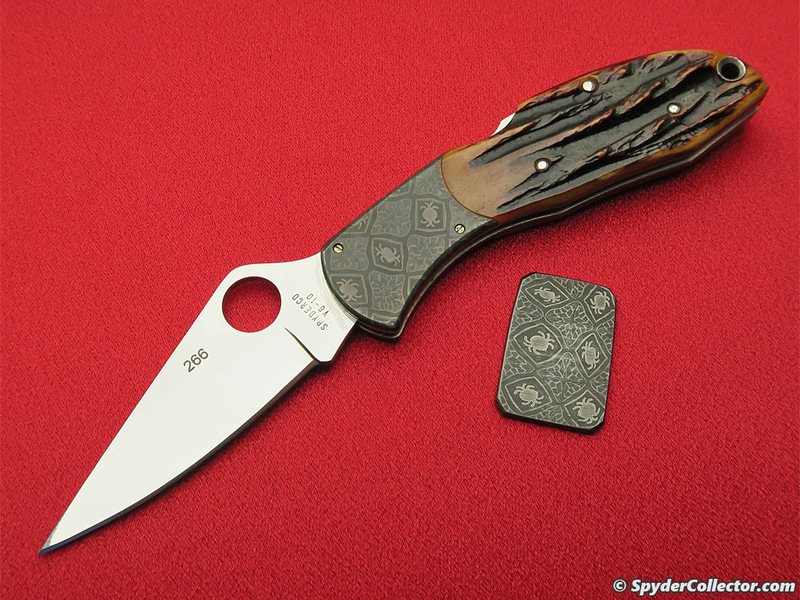 I’ll go ahead and assume that Sal Glesser, co-founder of Spyderco, was the main driving force behind the C76. And I would like to assume that Eric Glesser, Sal’s son who is succeeding him as head of the company, headed the C41 anniversary project. I have no factual info to support this, but please bear with me. 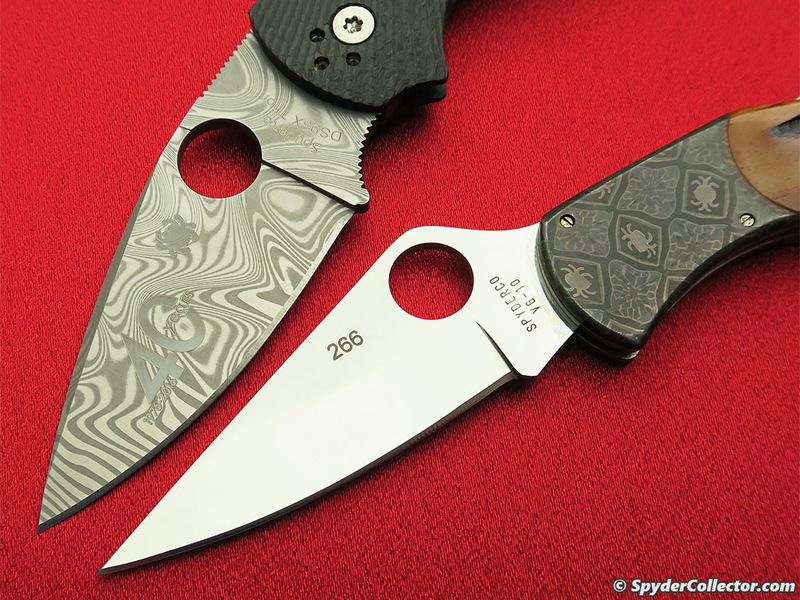 Sal, together with his wife Gail, started the Spyderco company from scratch, working and traveling out of a bread truck for years, and they built it into the respected knife company it was in 2003 (and still is). Considering where they came from, it makes sense to go all-out with the C76. 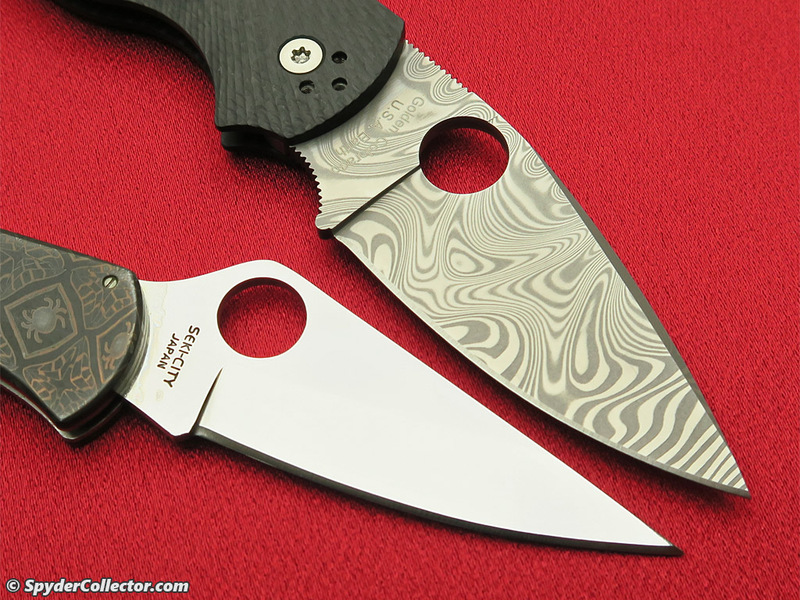 The anniversary Delica’s design almost seems a tip of the hat not only to the Delica, but also to the many custom makers that have helped Sal and Gail learn even more about knife making. 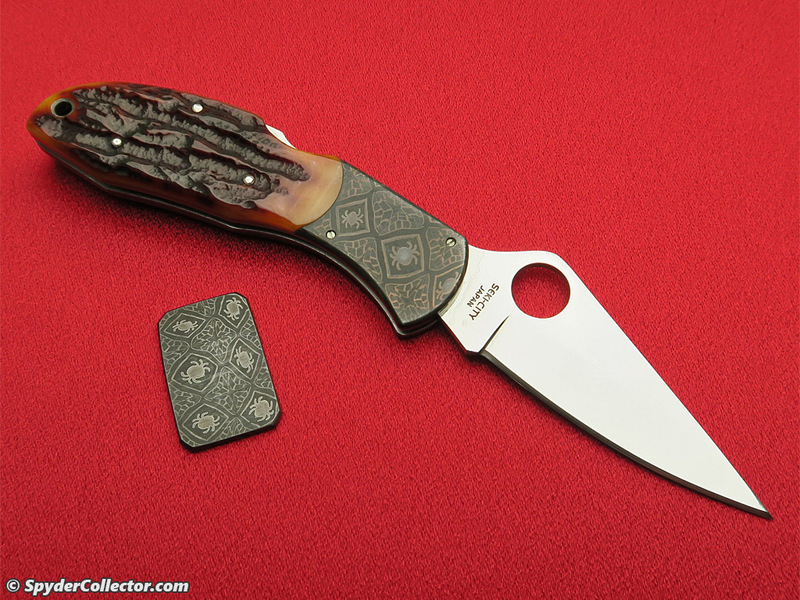 This Delica very much has the look and feel of a classic custom knife. The 40th Anniversary Native could be interpreted as a much more modern product. 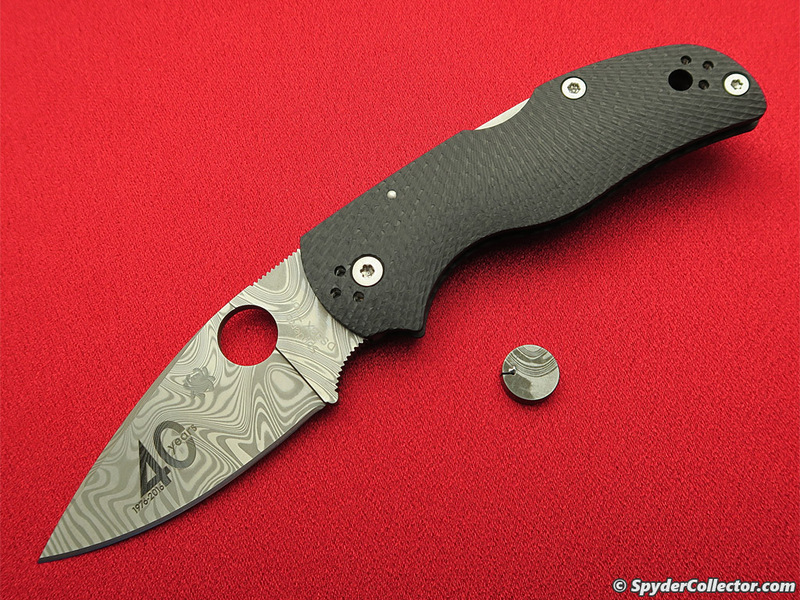 It is the design of someone who is proud of the Spyderco history, by evolving the classic C41 Native design. But also someone who is very committed to modern production and design, using a carbon fiber fluted handle. The C41 is a look into the future of knife making. This future involves modern production methods and materials for sure. But knife making only has a future when the knives are used, hard, and that might very well have been a motivation (conscious or not) for the C41 to have a much more practical –and therefore subdued- design. You could actually use this fine folder. The production run for the C41 was more than twice as big as the C76. 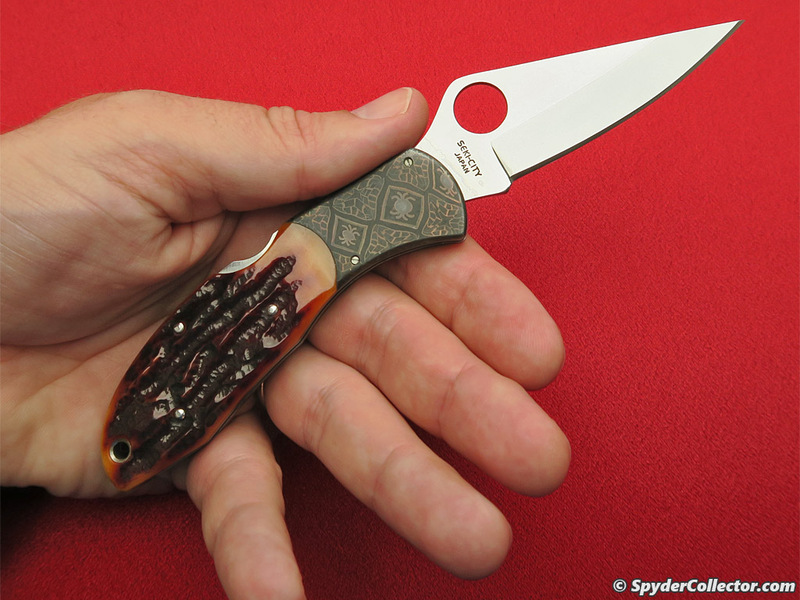 This primarily reflects the growing popularity of Spyderco knives since 2003, but perhaps it also invites actually using the knife. 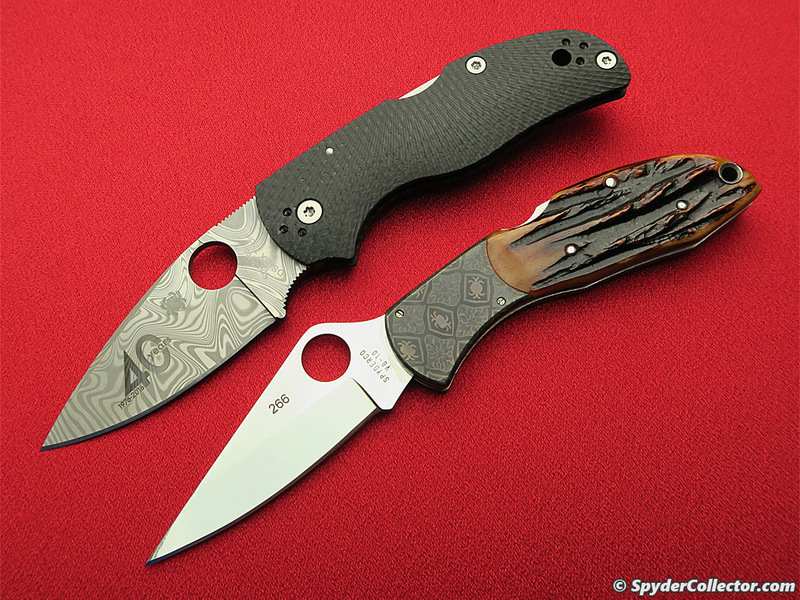 With Eric at the helm, building on the work of his parents and the many people that have and still make up the Spyderco crew, I am positive we’ll see quite a few celebration knives to come! There you have it, one fanboy’s appreciation of the anniversary knives of his favorite brand. Are these knives must-haves for a casual fan? Heck no. I did try to give an amateur analysis of these knives and how they, at least in my opinion, reflect the company at different times in its very respectable but still recent, history. I do actually use these knives on birthdays etc.… they only open a gift or two and that’s it. They make for nice conversation pieces too. Most importantly, I appreciate these as cool collector pieces. I have an anniversary of my own coming up, I’m turning forty soon. Guess which knife I’ll be carrying!